The FileMaker Platform makes it possible for you to create custom apps that run on any device, and you don't even need programming skills to do it. 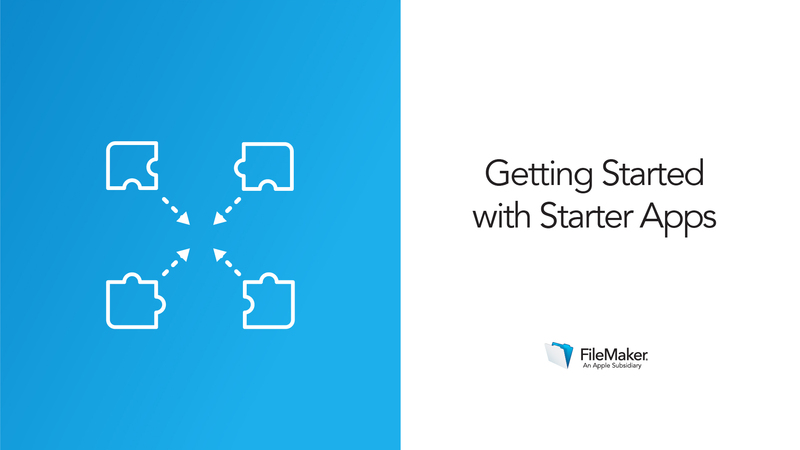 In this video, you'll learn how to begin your own custom app using FileMaker’s Starter Apps. Starter Apps are ready-to-use, simple apps that address common business needs. If one of the Starter Apps suits your needs, you can use that as a launching point for your custom app. It will provide you with layouts for users to interact with, tables and fields for your data, and even buttons and scripts pre-programmed to help you use the app easily. This lesson will walk you through choosing a Starter App and navigating through it. You’ll see how add more blocks of functionality with Add-On Tables, and even begin customizing your app. For more details on how to navigate FileMaker apps as a user, see the previous lesson in this tutorial. To take your customizations further, check out the Create Tutorial series. By learning just a couple steps, you can quickly put together a custom app that can be useful right away. Add-On Tables create space for more types of data in your app, to support your primary data. Watch how they work so you are sure to add them in the right area of your app. Get a tour of three different starter solutions and their primary features.